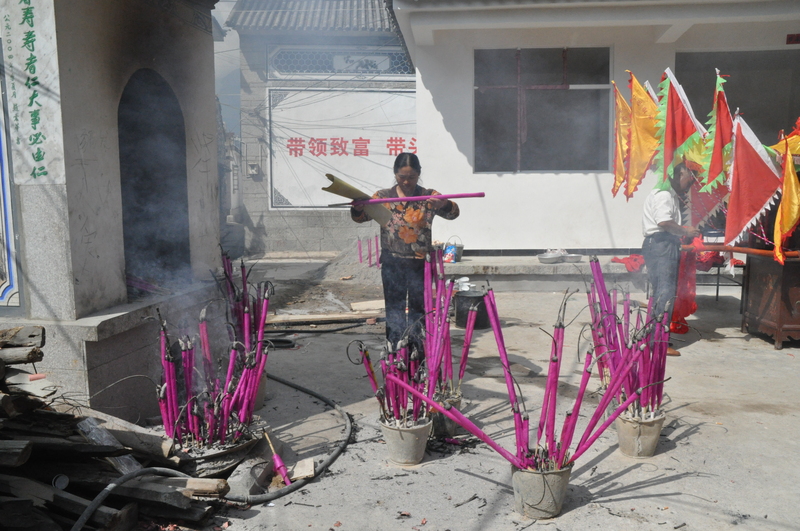 The last day of the Rao San Ling festival takes place at Hu Guo Ci temple in Ma Jiuyi village. The temple is over 100 years old, and its purpose is to commemorate the Princess Jingu. 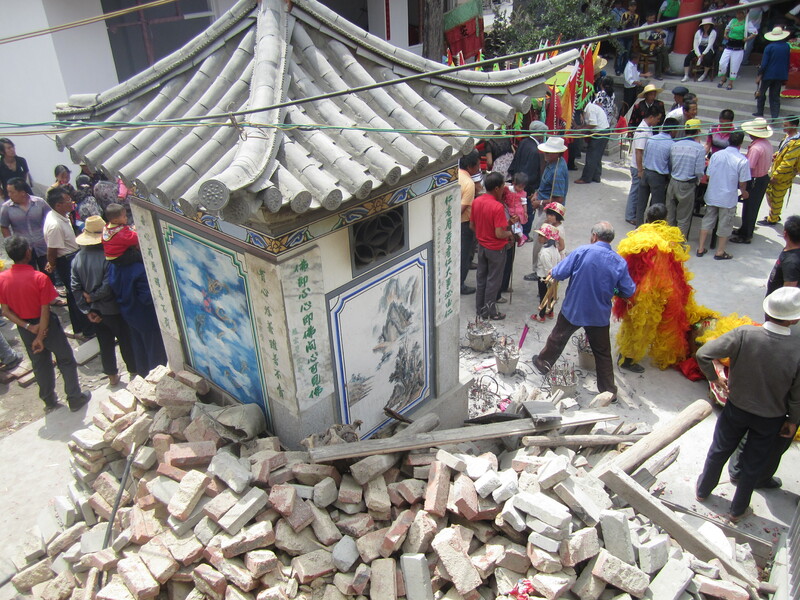 During the Cultural Revolution, the temple was destroyed and rebuilt one year later. 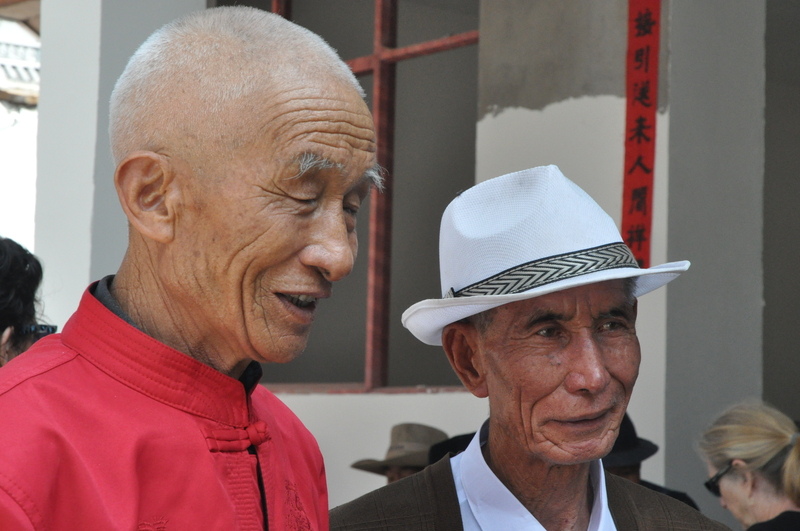 Our team was granted an interview with the community leaders prior to the procession taking Princess Jingu to the Benzhu temple by the side of Erhai Lake. 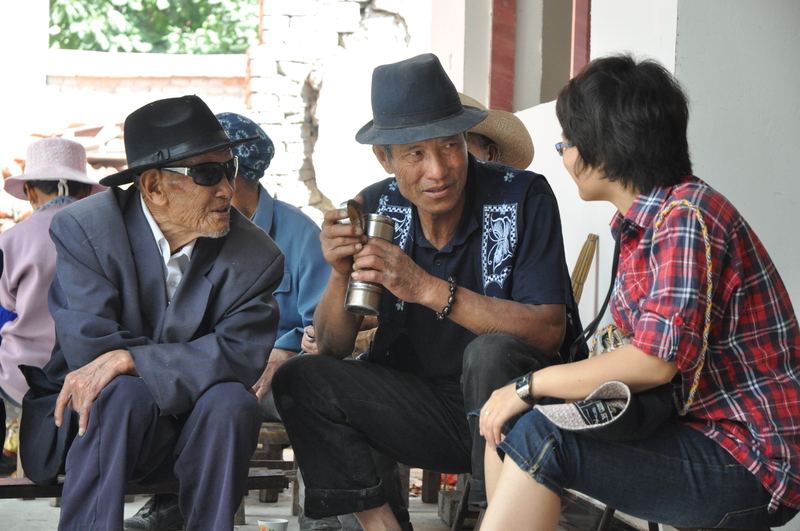 The four men tell us that the main God of the temple is the Regional General of Dali and the other Gods are his family. Every year, they come to this festival. 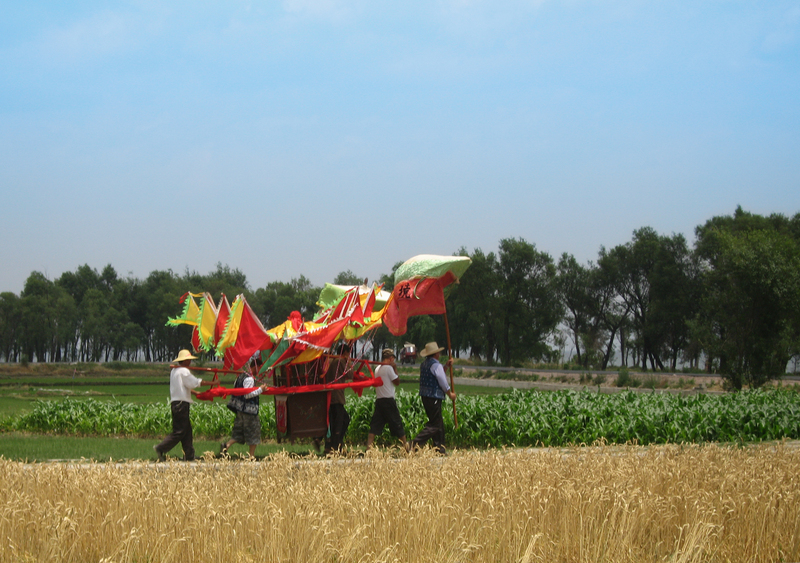 On this day, they carry a miniature of the general in the palanquin have a parade through the fields. The belief is that they will retrieve the Princess from the lakeside temple and return her home – this is the most important part of the festival. There are others in charge of organizing the wealth of food available at the festival. 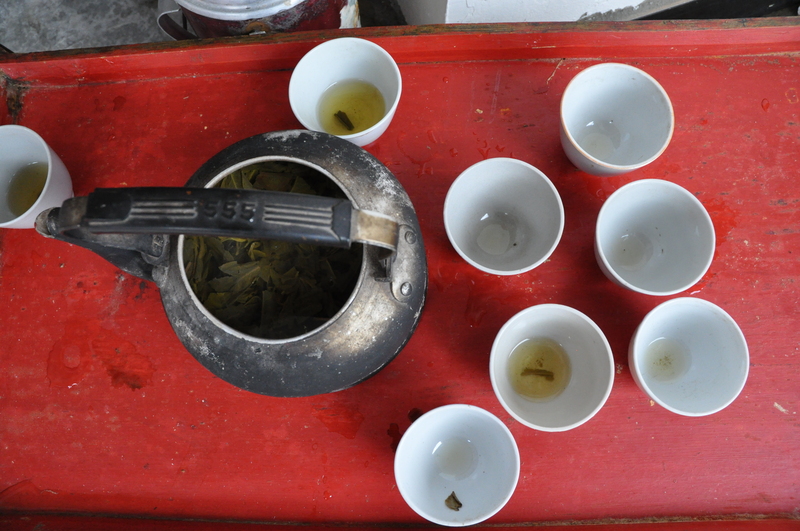 It takes days of perpetration in order to arrange all of the food and the festival. 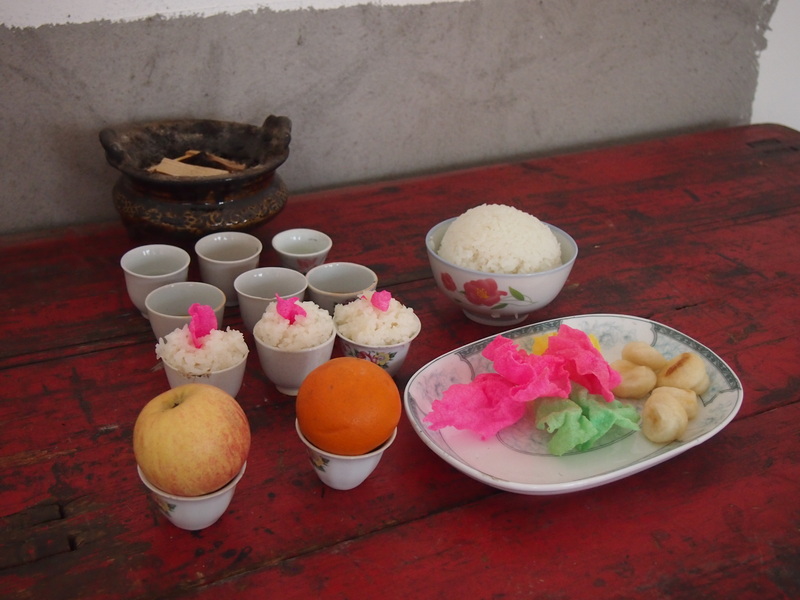 There are others from the temple that donate ten yuan and 1kg of rice per person for the festival, while outsiders donate 20 yuan to the temple. 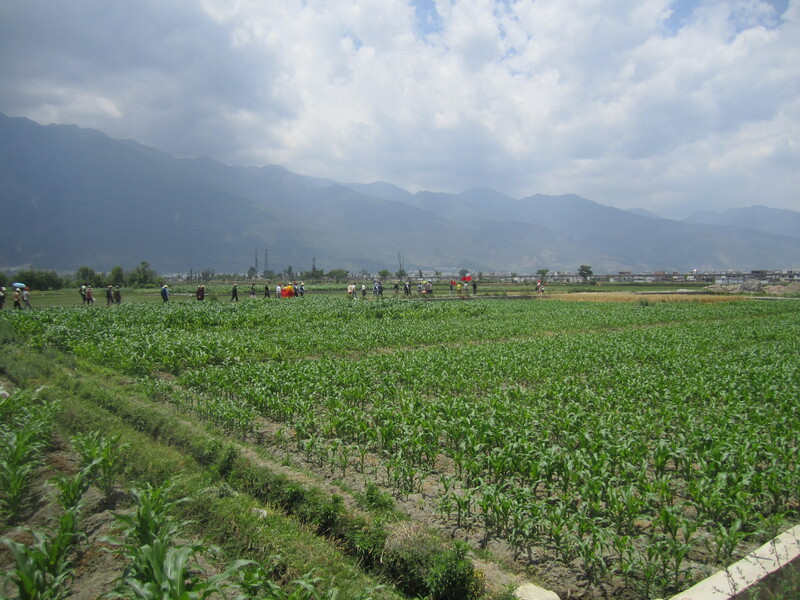 All of the members of the group are farmers – mostly rice farmers. At the final stage of the festival, the Bai people go to the Benzhu to pray for crops and rain, followed by a shared celebratory meal together. Before the procession, our team was invited to lunch while the community members prepare for the event. 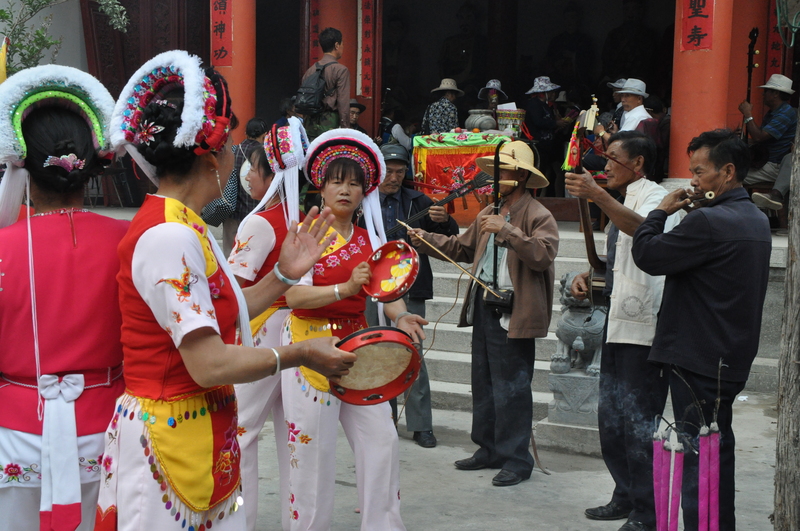 After lunch, the dance groups return with instruments, fans, rattling sticks, and small speakers to amplify their songs. In the meantime, the men prepare the Princess’s palanquin for the parade. They put a small picture of the princess inside the cart with an altar of fruit and flowers. 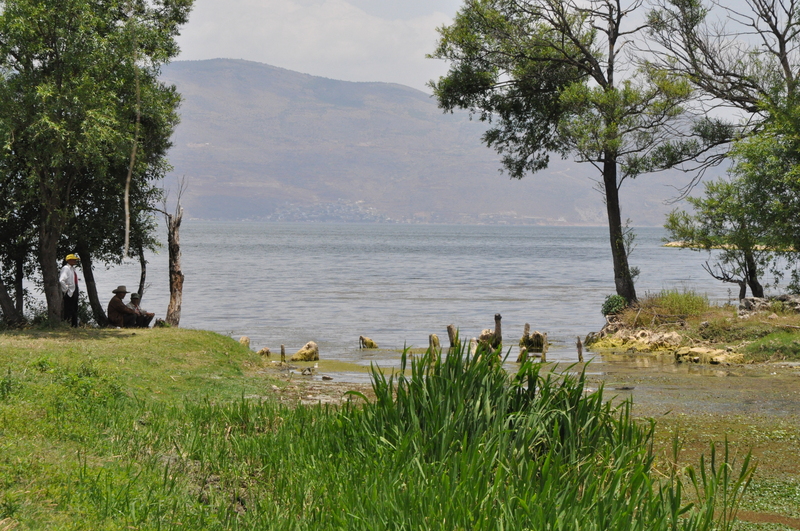 Then, the first procession to the lakeside temple begins. Two men carrying large cloth umbrellas lead the procession with at least four people carrying palanquin shortly behind. 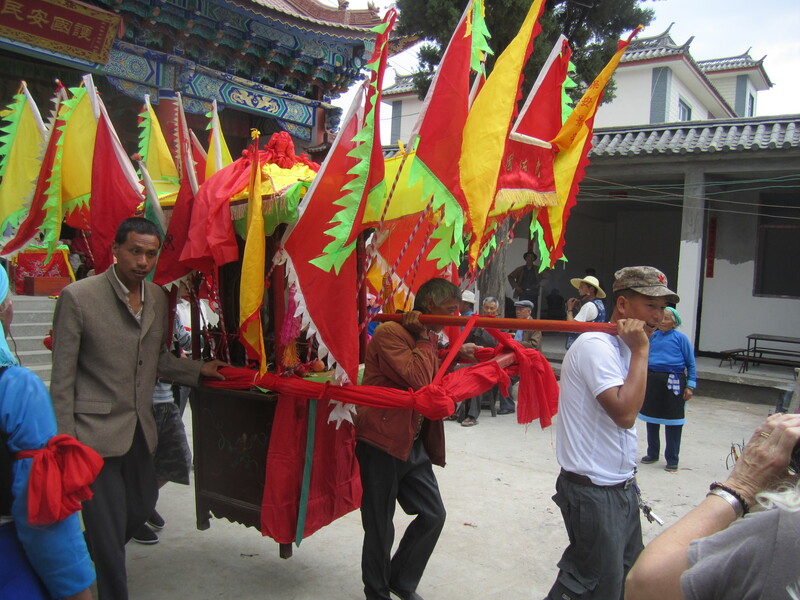 The procession continues through the village until arriving at the temple beside Erhai Lake. There are already burning altars seen along the path and water stations set up along the road. 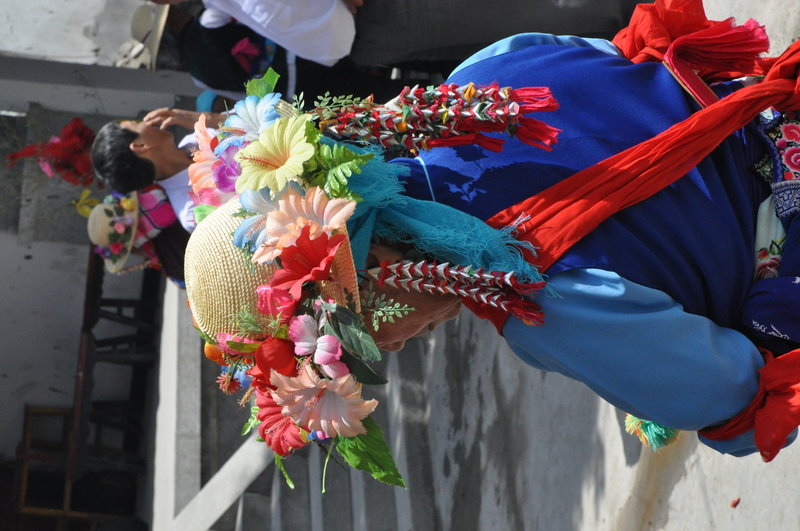 Not many people join in the first procession, but occasionally community members will follow along the journey. 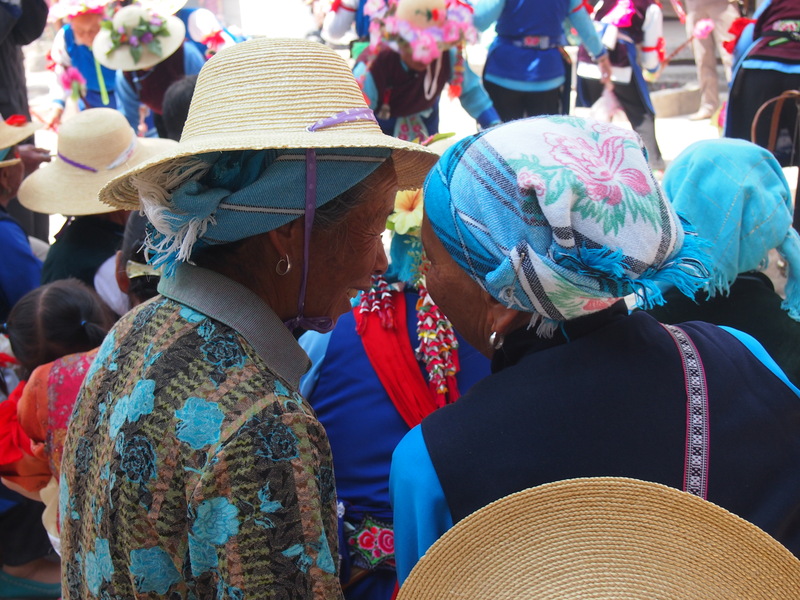 At the temple, three women’s groups are gathered while chanting and praying at altars both inside and outside the temple. 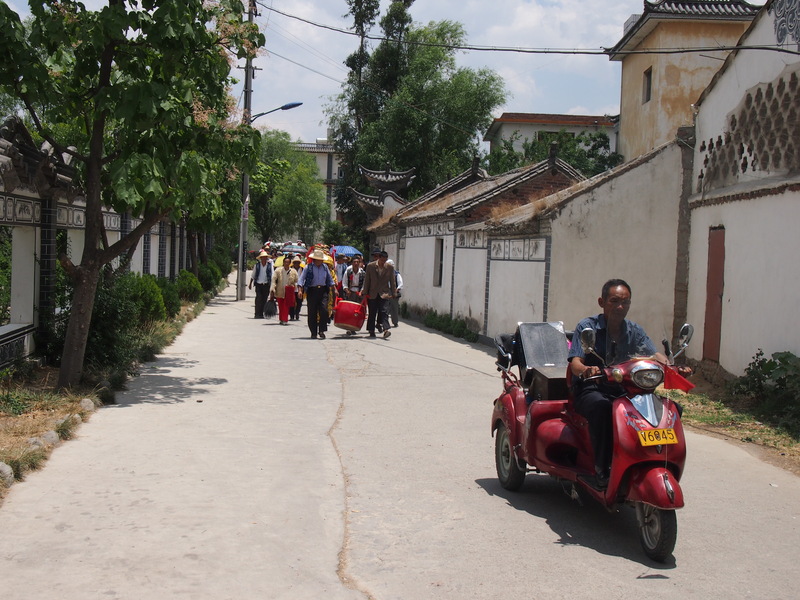 Following this procession, our team returned to Hu Guo Ci temple as Bai community members continue their prayer. Firecrackers and drums signal the second performance and procession. 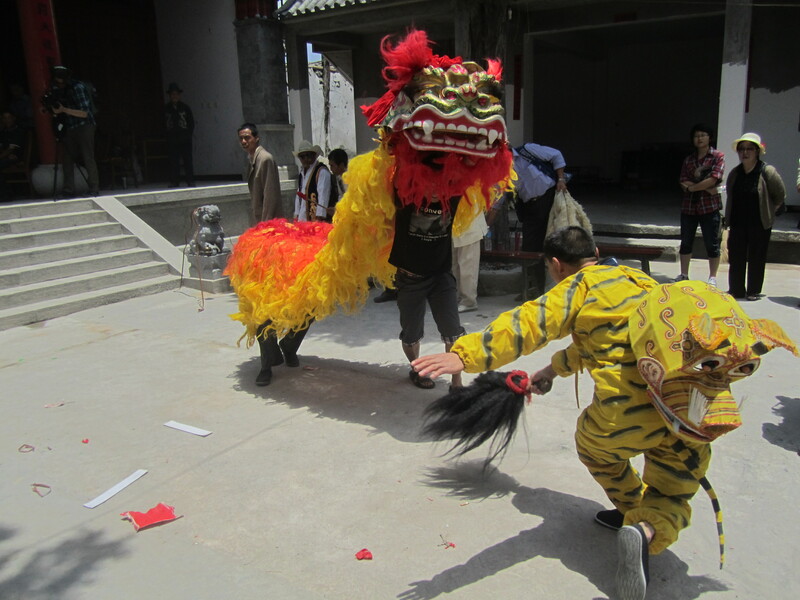 A man in a white mask swings a horse tale and guides the lion throughout the temple courtyard. 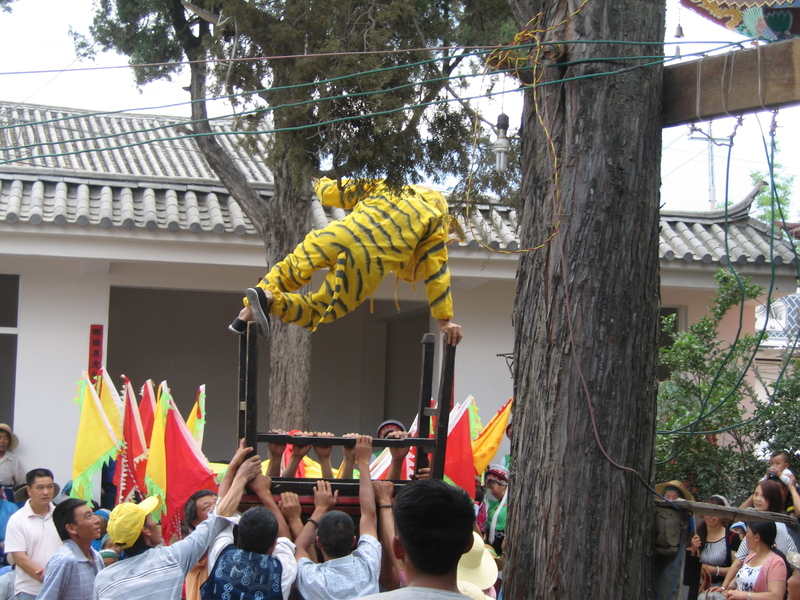 Another man wields a large stick and guides the tiger circling the lion. These men are known as the shepherds. 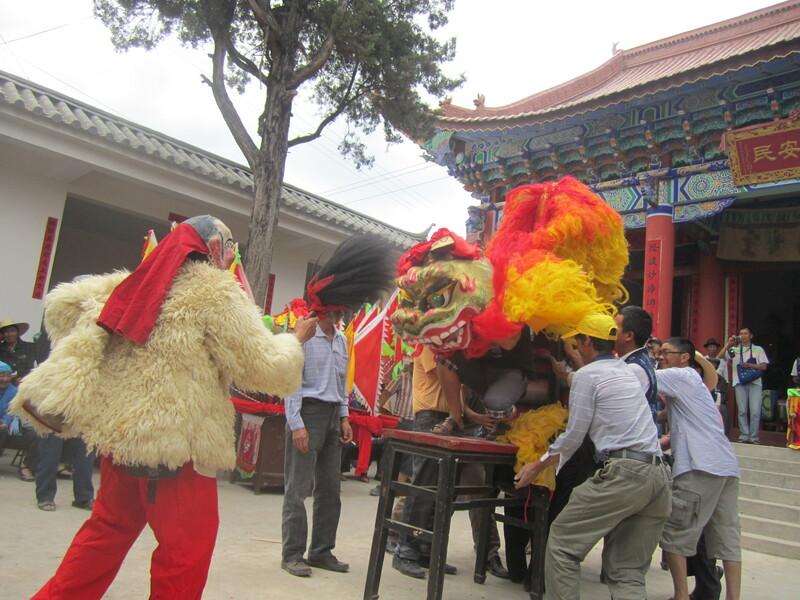 Following this performance in the temple courtyard, the second procession to the Benzhu temple at Erhai Lake begins. 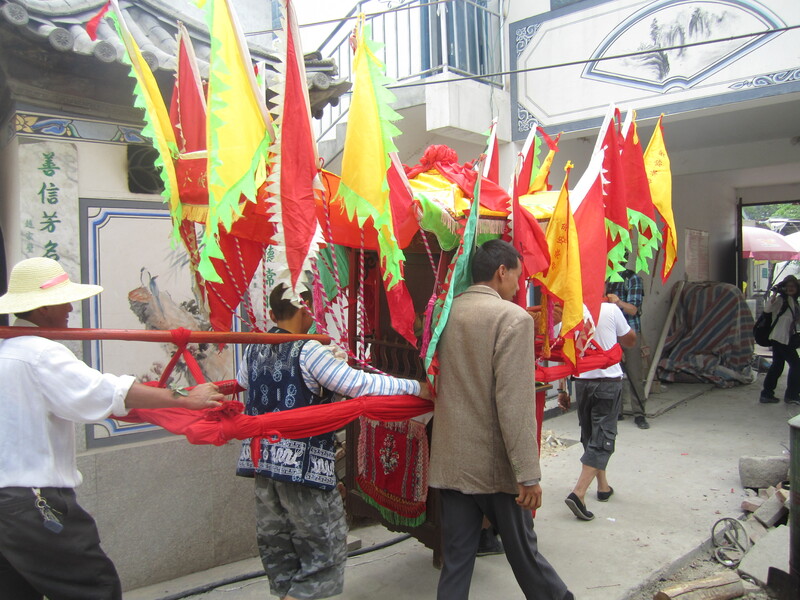 Many more members of the Bai community and Ma Jiuyi village join in the second procession. Teenagers and children wave flags while folks watch from their houses – some even leave their abodes to join the procession. 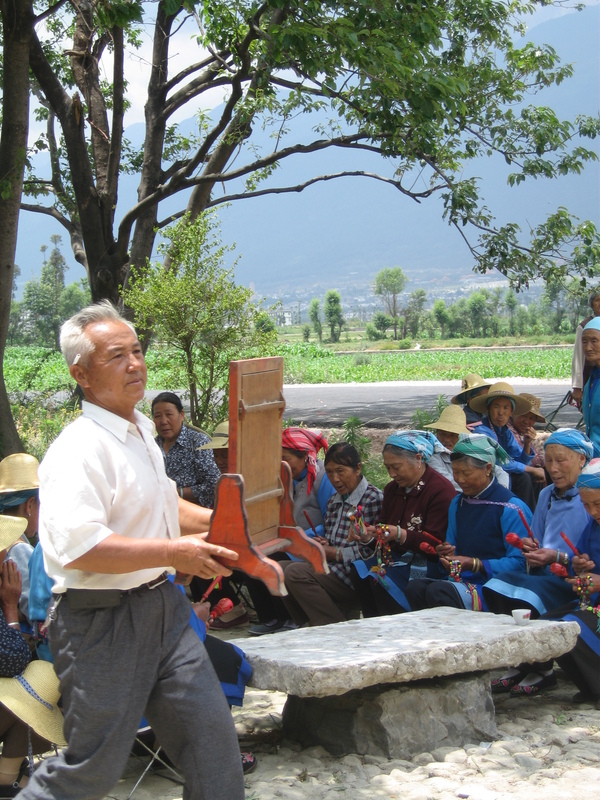 Many of the followers are dressed in both contemporary and traditional Bai clothing. Regarding age groups and gender, this day has by far the most diverse turnout. Once at the lakeside temple, people gather inside and out to perform impromptu and choreographed dance performances. 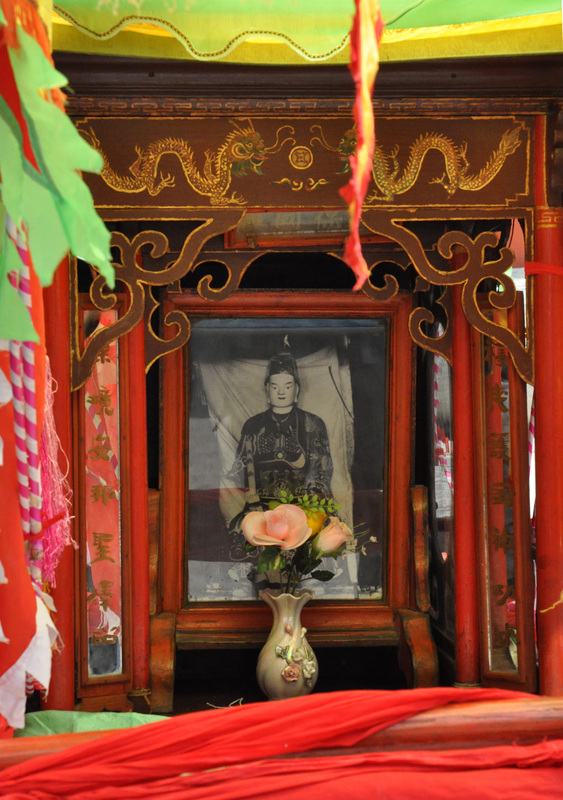 After proceeding to the Benzhu temple at Erhai Lake, the Bai people leave the temple and proceed back to Hu Guo Ci temple. Along the return route, the procession stops multiple times as the dance troupes and lion and tiger perform at smaller temples throughout the village. 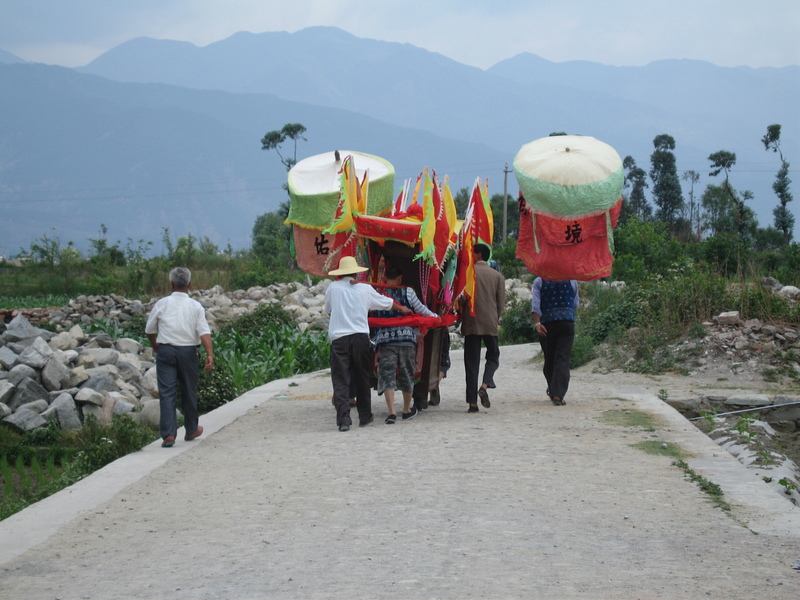 On the way home, many more of the villagers help to carry the palanquin and return to the temple. 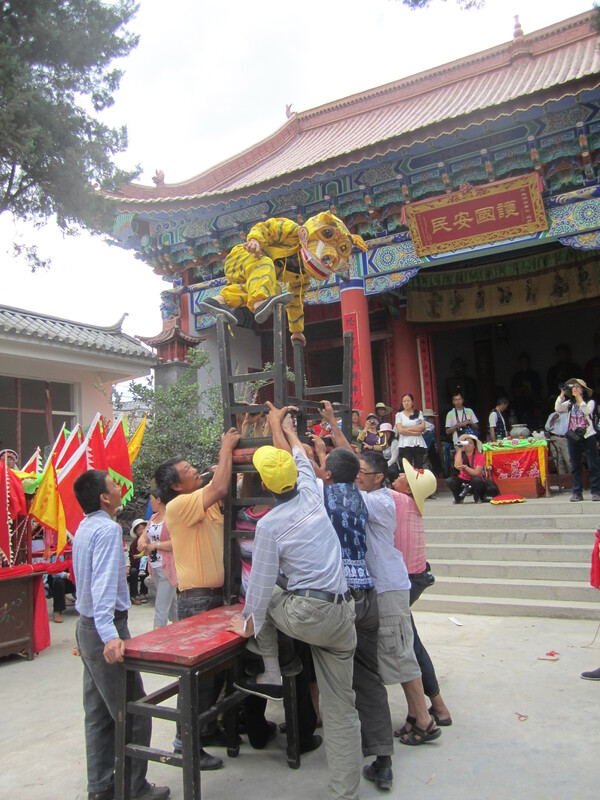 Upon returning, the lion and tiger dancers perform an acrobatic routine over a constructed set of tables and chairs. The men hold together three small tables to make a pyramid over which the shepherds guide their animals (the lion and tiger). The tiger continues to push the limits of the dance by making multiple rounds as the men stack the tables higher and higher. After this performance concludes, the princess is returned to the temple and Bai community members continue their normal prayer rituals. The videos below for this section are split into three parts. 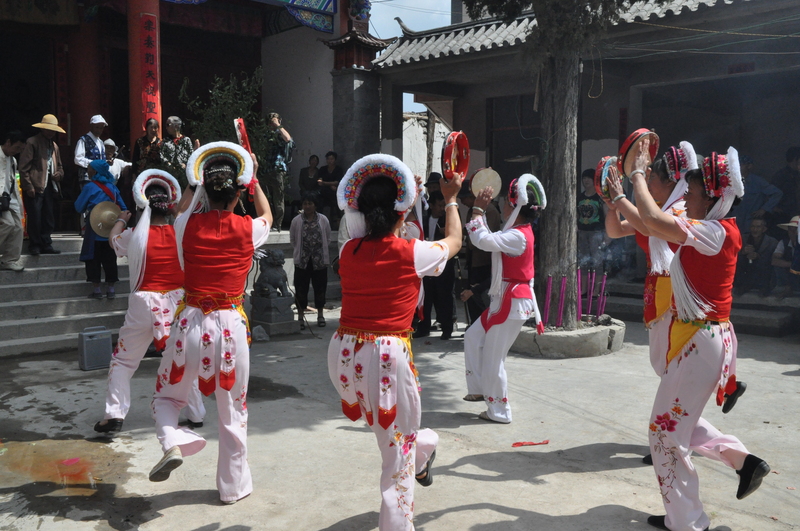 The first part consists of the beginning ceremonies and dances at Hu Guo Ci temple. 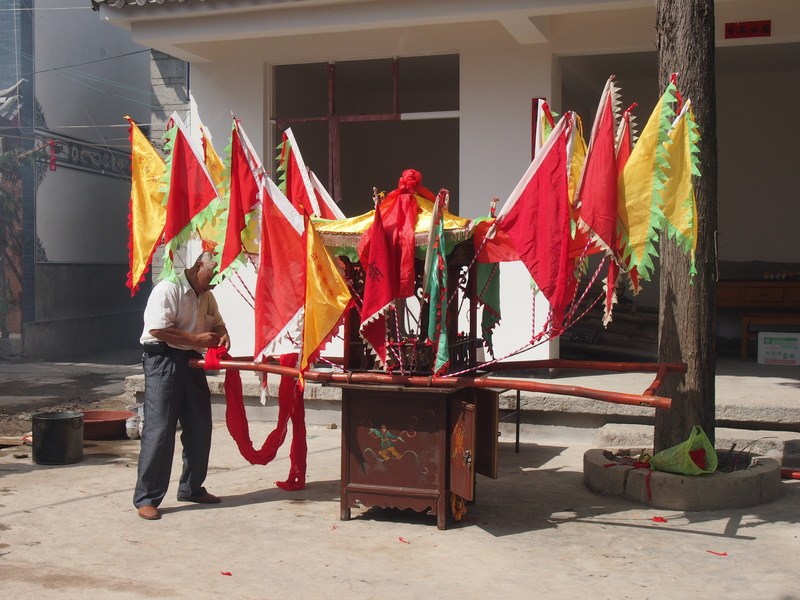 This includes preparing the palanquin and the first procession to the Benzhu temple at Erhai Lake. 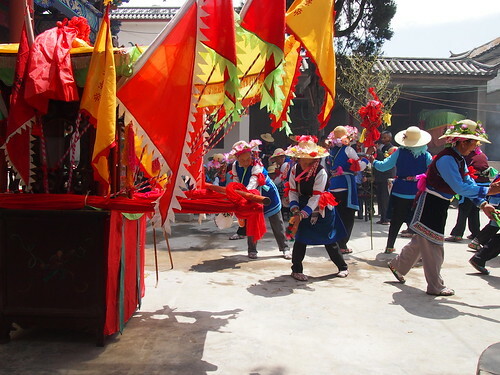 The second includes the initial dances from lion, tiger, and shepherds, the second procession to the Benzhu temple at Erhai Lake, and the final return to Hu Guo Ci temple. 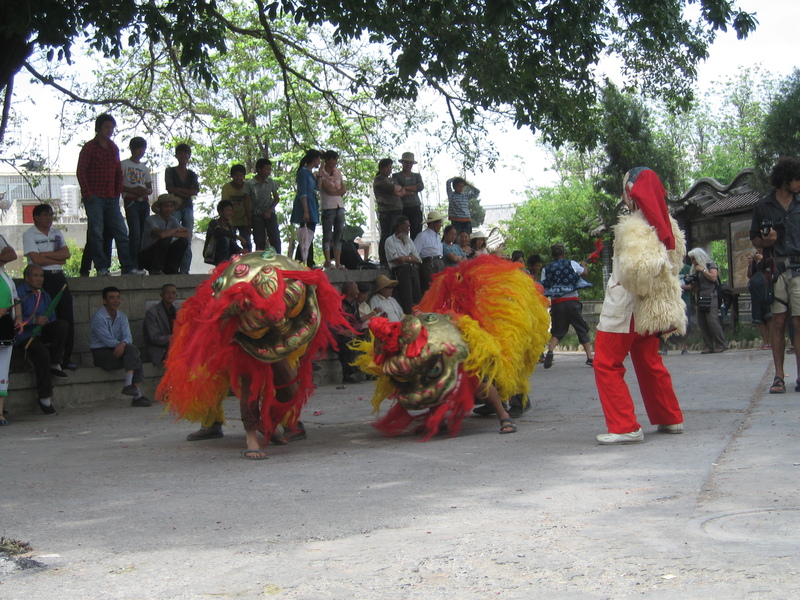 The final part includes the conclusive dances and performances from the lion and tiger in the Hu Guo Ci temple courtyard.